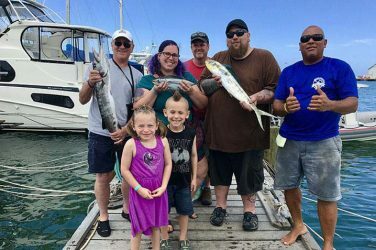 ORANJESTAD — Fishing has been excellent so far in July, with charter fishermen landing big game on the east side of the island. Yellowfin and Blackfin Tuna take the spotlight, followed by some Wahoo. 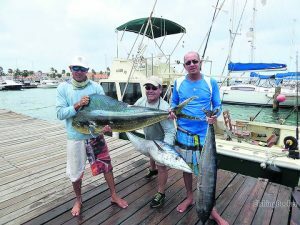 The south side of Aruba produces a good deal of Kingfish, Bonito, and Mahi Mahi. Once you head out, you will face the typical Aruban wind and 3–6 ft waves, but overall, fishing is superb and you should definitely head offshore. 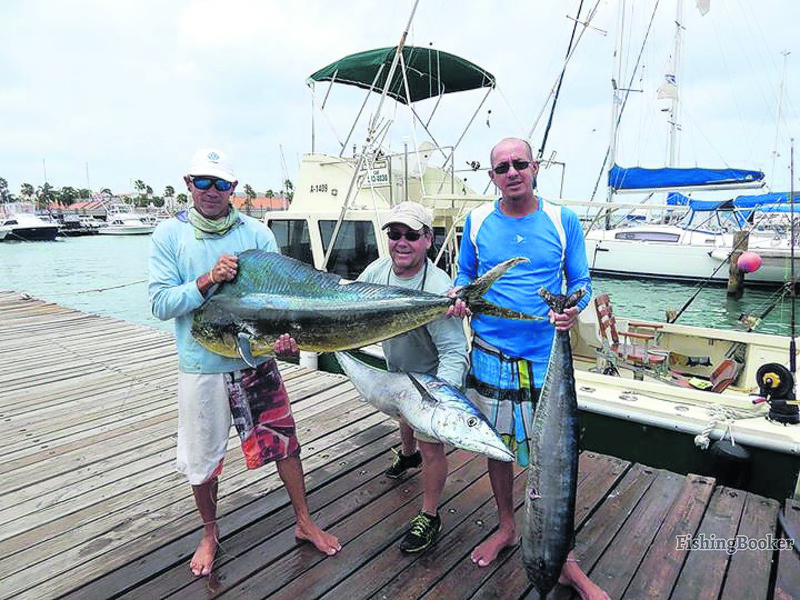 Aruba fishing in July is all about big fighters, fast hard-hitters, and tasty bottom fish. You can get Wahoo, Mahi Mahi, Yellowfin and Blackfin Tuna, Kingfish, Sailfish, and Blue Marlin while trolling offshore. If the action is slow, you can switch to jigging. 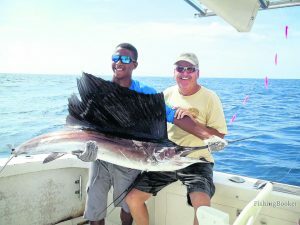 Captain Milton Pichard of Teaser Charters has caught a lot of game fish on six- and eight-hour trips. He reports that right now fish are further out, but their bite is still in full force. If you’re up for bottom fishing, you can catch a variety of delicacies. Captain Roberto Tromp of Dorothy Fishing Charters has caught Triggerfish, Yellowtail Snapper, Red Snapper, Strawberry Grouper, and Amberjack. 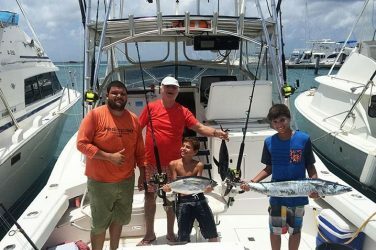 His customers have also hooked into Bonito, Mahi, Wahoo, and some Billfish. Where to fish this month? 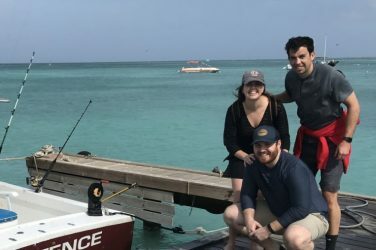 Local captains mostly fish the east side of Aruba right now. 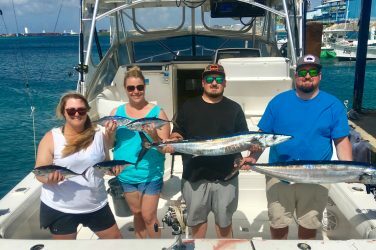 If you’re heading out of Oranjestad, a six- to eight-hour trip will be enough to reach these fisheries and troll for big fish, including Wahoo, Mahi, Yellowfin and Blackfin Tuna, and Billfish. 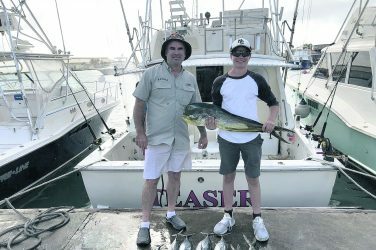 Captain Milton has been fishing the east side of Aruba with a lot of success this month. He also reports that Noord is a productive fishing spot at the moment. If you want to go on a four-hour trip, you will have the best chances fishing the south side of the island. Captain Milton and Captain Roberto have both caught Kingfish, Bonito, and Mahi Mahi here while trolling and jigging. But there are other fish here as well. 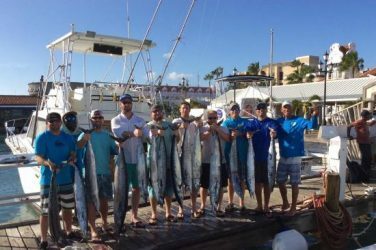 Captain Roberto has snatched some Wahoo here, and has also managed to land Sailfish and Blue Marlin in the south-western waters of Aruba.